* Brushed Satin Finish Our spherical bushings are made of super strong 7075 Billet Aluminum, Teflon lined Com bearing for maximum part life. These bushings will let your rear upper control arms and rear end move smoother and faster for more traction every time. Quality Construction: Made from 7075 Billet Aluminum to replace the stock rubber bushing and press into the housing. No one else gives you the bold clean styling of our Aftermarket Dress Ups, Suspension and Performance Parts for your American Muscle Car like UPR Products! Installs in 1.5 hours or less. 12mm Grade 10.9 Hardware Included. **TIP: Freeze the bushings the night before you plan on putting them so they shrink just a bit and make them easier to put in** Click Here for Instructions Fits these Vehicles: 1978 1979 1980 1981 1982 1983 1984 1985 1986 1987 1988 Buick Regal Grand National GNX T Type Chevrolet Monte Carlo El Camino Malibu Caballero Oldsmobile Cutlass Pontiac Grand Prix Grand LeMans Bonneville. 1964 1965 1966 1967 1968 1969 1970 1971 1972 Chevrolet Chevelle SS 454 Malibu El Camino Oldsmobile 442 Buick GS 455 Pontiac GTO A Body. 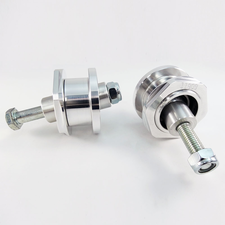 Our spherical bushings are made of super strong 7075 Billet Aluminum, Teflon lined Com bearing for maximum part life. These bushings will let your rear upper control arms and rear end move smoother and faster for more traction every time. Made from 7075 Billet Aluminum to replace the stock rubber bushing and press into the housing. Installs in 1.5 hours or less. 12mm Grade 10.9 Hardware Included. 1978 1979 1980 1981 1982 1983 1984 1985 1986 1987 1988 Buick Regal Grand National GNX T Type Chevrolet Monte Carlo El Camino Malibu Caballero Oldsmobile Cutlass Pontiac Grand Prix Grand LeMans Bonneville. 1964 1965 1966 1967 1968 1969 1970 1971 1972 Chevrolet Chevelle SS 454 Malibu El Camino Oldsmobile 442 Buick GS 455 Pontiac GTO A Body.